As i’m sure you can tell from the title, my first foray in a while in home brewing didn’t go entirely to plan. Lets just say a couple of knowledge gaps and unseasonably warm weather scuppered my brew. I’d originally not planned on documenting this batch (notice the lack of pictures) but for the sake of transparency and me not repeating my mistakes I thought i’d post it anyway. The ingredients for this batch came as part of my recently purchased BIAB kit from Geterbrewed. Brew day started uneventfully, around 26 litres of stike water was heated up to the 68 degree mark in about 30 minutes, the false bottom and brew bag were added followed by the malts. Everything mashed happily for an hour at around the 66 degree mark without losing too much tempreture. After the hour, the bag was pulled and allowed to drain. Here was problem #1 – I don’t think I allowed the malts to drain properly as I only ended up with around 20 liters left in the kettle – this could also have been my terrible measuring – i’m not sure. The wort was then brought to the boil in about 30 minutes with hops added at 60, 10 and at flame out – i’m not sure which as they packets weren’t labelled. At 15 minutes the Whirlfloc and the immersion chiller was added to sanitise. Once boiling was done, everything was chilled to the low 20’s using the copper immersion chiller, the wort was transferred to the fermentation bucket and the yeast was pitched. Here lies problem #2 – due to my rubbish draining of the malts and a possible high boil off rate on the kit, I only ended up with around 16.5 liters of wort in the fermenter – I ended up adding around 1.5 liters of cooled boiled water to increase the volume. The original gravity of the beer (OG) ended up at 1.065 which is a tad higher than the recipes stated 1.060. Fermentation started within 12 hours of pitching and bubbled happily for around 4 days before coming to a stop. Unfortunate I think this is where Problem #3 kicked in. Due to unusually high temperatures in early July (2 weeks of 25 to 30 degree C days) the ambient temperature in the house was far higher than it should have been. My under-stairs cupboard usually holds a steady 18 to 19 degrees ambient, but during this couple of weeks it was consistently around 24 degrees, which ended up causing issues. After 9 days I decided to take a final measurement and bottle the beer. Final Gravity (FG) was 1.011 equating to a 7.1% beer which was a little over the 6.4% stated in the recipe. After racking off the beer into another container and adding dextrose syrup for carbonation, bottling went without a hitch. Initially it was a messy process but once I got my flow I ended up bottling 9 660ml glass bottles and 18 500ml PET bottles. Everything was stuck back in the cupboard to age. I think i may have picked one of the last bottles to be filled as this one refused to settle out and was cloudly even when crash chilled in the fridge then freezer. Not at all pleasent as I think there was a fair bit of trub. Dumped this one. Had some friends round so tried again, this time one of the big 660ml bottles. Chilled for 24 hours prior. Beer was very hot on the back end, quite solventy and very alcoholic – far more than it should have for 7.1%. On reading up, this is probably down to a very warm fermentation stressing the yeast. The alcohol should mellow out over time so will probably sit on this for another couple of weeks to see how it fairs, if its not improved i’ll likely dump the rest of the batch. While not being an absolute disaster this one really hasn’t gone as planned. I think i’ll sit on the bottles for the next month or so, sampling one a week and make an informed decision from there. In the mean time i’m starting to plan for batch #2 – using some heat tolerant yeast if these temperatures are going to continue. 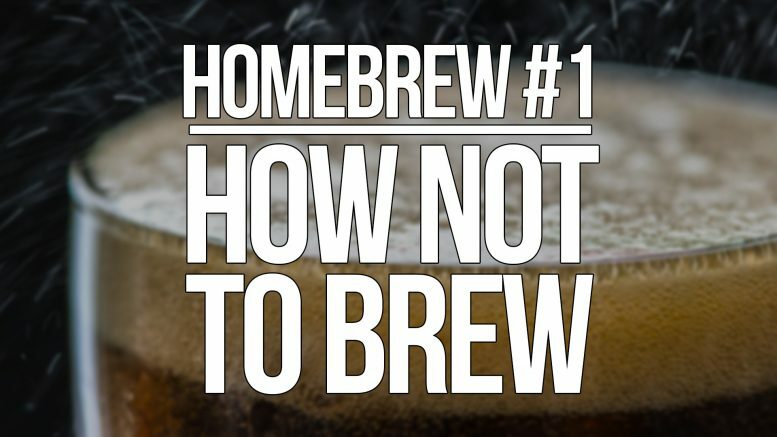 Be the first to comment on "Home Brew #1 How Not To Brew"